In my previous blog post I demonstrated how we can allow the user to save their culture preferences, and then apply the correct culture preferences once the user has signed in. We allowed the user to set the Culture and the UI Culture, but I think in a real world scenario that is not very realistic. Typically we will want to give the user more fine-grained control to set their language, date format, time format, currency etc. Before we get to that, let us first cover a couple of principles. Firstly, let us talk about the difference between the Culture and the UI Culture. The UI Culture is used to load resource files, so if you created resources for different languages, these will load depending on the value of the UI Culture - so the UI Culture determines the language our user interface is rendered in. The Culture on the other hand is used to for formatting culture dependent values, such as date formats, time formats, the currency symbol, an so forth. 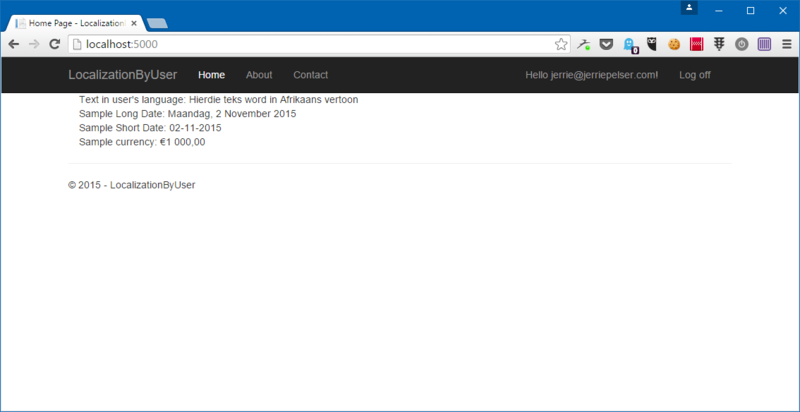 it will return a culture settings for Afrikaans (South Africa). It is important to note however that we do not need to create a CultureInfo instance with these pre-defined settings. We can override any of the settings for a CultureInfo settings if we want to. So in understanding these two principles, we are going to extend the example from the previous blog post to allow the user to select a language, and then also specify their preferred date, time and currency formats. // Source code omitted for brevity. Please note that because this JSON-serialized instance is stored in the cookie, you would want to keep it as small as possible, therefore I chose to serialize the property names to very short strings, such as “c”, “l” etc. I still store the actual date formats as long strings however, which is not very efficient and adds to the size of the cookie. You may want to rather just store an integer representation of the various formats and store that inside the database (and subsequently the cookie) and convert it at runtime to a full format string. Note that I set both the culture and the UI culture to whatever the language is that the user chose, and then override the culture object’s properties with the correct date formats and currency symbol. This will ensure that long dates will contain the correct localized month and week names in the language the user selected. 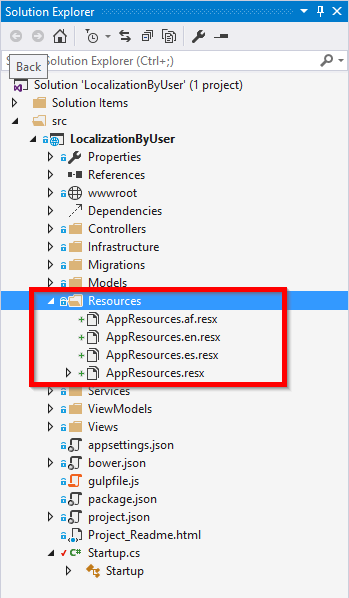 // Add Entity Framework services to the services container. // Add Identity services to the services container. I have injected an instance of IHtmlLocalizer<AppResources> which will give me access to the “WelcomeText” resource string which is located in the AppResources.resx file, and then I just display the localized version of that resource string. I also display the current date in the correct long and short date formats, as well as display the value of “1000” formatted as a currency. 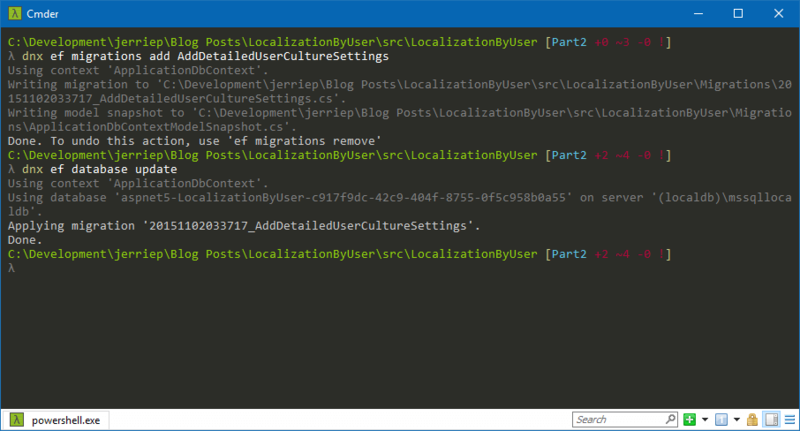 There are currently a few issues with the tooling which makes working with localization a bit of a challenge. When you edit the above mentioned file, it will always reset the visibility of the class in .designer.cs file to internal. You will need to go and edit it manually to change it back to public. In this blog post I extended the sample from the previous blog post to allow user’s to specify much more fine-grained culture settings by allowing them to specify the language, date formats and currency symbol. This example is not perfect, but it is a good start for you should you want to employ a similar method.